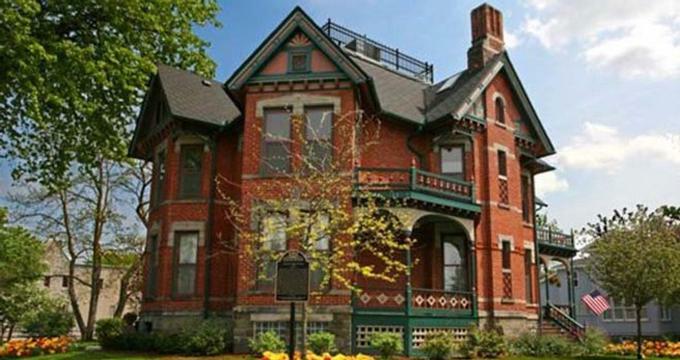 The Historic Webster House is a beautifully preserved mansion with a rich heritage in the heart of Bay City that now serves as a charming bed and breakfast. Blending Old World charm with modern luxuries, the Webster House features stylish accommodations with elegant décor and antique furnishings, private bathrooms and modern amenities, including cable television and complimentary wireless Internet. Exceptional gourmet breakfasts are served each morning and an evening wine and cheese reception is the perfect way to meet fellow guests and socialize. The Webster House also features an on-site spa and sauna room for the ultimate in relaxation and rejuvenation, and spa services include massages that can be enjoyed in the privacy of the guest chambers. The property is home to beautifully landscaped grounds complete with a private gazebo and outdoor fireplace for sultry evenings under the stars and its convenient location in the heart of Bay City make it the perfect base for exploring the region. 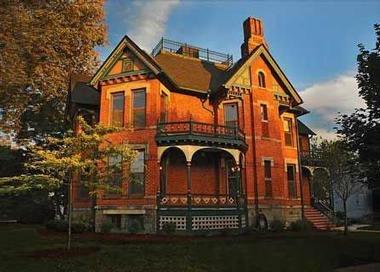 The Historic Webster House features eight unique rooms with private bathrooms, three of which have Jacuzzi tubs, two with skylights, fireplaces, and modern amenities, including flat-screen televisions with cable channels, central climate control, alarm clock radio, and complimentary wireless Internet. Additional services include a nightly turndown service, in-room massages, in-house laundry and ironing, and complimentary beverages. 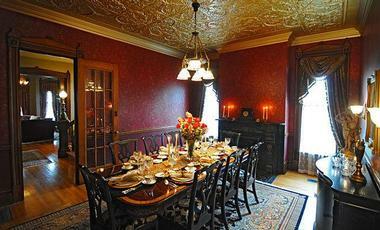 The Webster Room is named after the original owner of the home, Honorable Thomas E. Webster and is decorated in rich maroon and gold accents. The room features a hand carved feather-top queen bed with designer bedding, and a private bathroom with a grand Jacuzzi tub for two, ivory tilework, heated towels rails, and organic toiletries. The room also offers a large work desk with complimentary wireless Internet, and modern amenities include flat-screen televisions with cable channels and central climate control. The Judge’s Chambers is located on the third floor of The Webster House and is decorated in vibrant shades of tan, brown and slate blue. The room features a queen-size brass bed with luxurious linens and a private tiled bathroom with a Jacuzzi tub, organic bath products, and skylights with beautiful views of the Michigan sky. The Signature Room is decorated in beautiful hues of pink, red, gold and green and features high ceilings and crown moldings. The room has a gorgeously carved cherry, feather-top queen-size bed with designer linens and an en-suite marbled bathroom with a shower/bath combination and deluxe bath amenities. 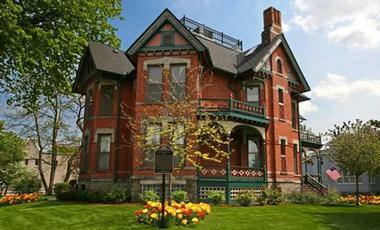 A large bay window boasts beautiful views of the downtown Bay City skyline. The Nodoka Room exudes timeless elegance and modern comfort in this Asian-inspired haven of serenity, which is decorated with Far-Eastern décor and features a luxurious queen, feather-top bed with custom bedding. An en-suite bathroom has a walk-in shower and whirlpool tub for two, and a cherry drop-leaf table and Oriental rug add a unique charm. 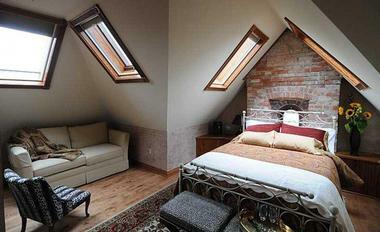 The Magistrate Room features exposed bricks and a slanted ceiling with skylights to create a modern, stylish ambiance. Located on the third floor, the room is decorated with art deco furnishings and features a luxurious feather-top queen-size bed with designer linens in maroon, gold, and green hues. A private bathroom features a walk-in rain shower, plush towels, and luxe bath amenities. The Miss Yunji Room is an Asian-inspired room decorated in soothing tones and features grass cloth walls, hardwood flooring, an ornate fireplace and beautiful stained-glass windows. Exuding luxury and elegance, this room features a luxurious, feather-top four-poster queen-size bed with imported European feather bedding. A designer writing desk and separate makeup sitting area offer added convenience, and a private bathroom features a terrazzo marbled floor, a dual walk-in shower, and organic bath amenities. 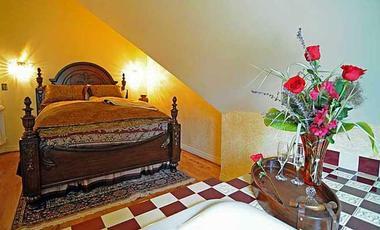 The Keep Room is a spacious five-room suite that boasts a blend of old and new. The suite features two bedrooms with en-suite bathrooms, a comfortable lounge with fireplace and bar area and guests staying in this suite enjoy unlimited access to the exclusive spa/sauna room and a separate bar area. The Bench Room is a cozy room with gorgeous blue suede walls and features two twin sofa sleeper beds, and a private bathroom with an antique claw-foot tub and overhead shower just down the hall. A complimentary gourmet breakfast is served in the breakfast room every morning and includes a variety of freshly prepared, made-to-order dishes, fresh fruit and juices and hot tea and coffee. The elegant breakfast room has a distinctly Asian feel with Bradbury and Bradbury custom wallpaper, an ornate fireplace, and luxurious furnishings. The Historic Webster House features an array of amenities, including delicious gourmet breakfasts served each morning and wine and cheese reception every evening. Complimentary beverages and snacks are available throughout the day, and the House also has an on-site spa and sauna with a range of spa services, including massages that can be enjoyed in the privacy of guest rooms. The property is home to beautifully landscaped grounds complete with a private gazebo and outdoor fireplace for sultry evenings under the stars. The Webster House is located in Bay City in the midst of mid-Michigan and is a short walk from Bay City’s historic downtown district, which is home to the largest antique center in Michigan, as well as numerous other antique stores and boutique shops. Bay City is home to a range of restaurants, cafés, pubs, and bars, as well as a vibrant nightlife, live entertainment, and a host of festivals and other happenings. Renowned events include world-class powerboat races on the River Roar, The Bay City Fireworks Festival, the Tall Ships Challenge and Sundays in the City. The Historic Webster House is home to an exclusive Spa and Sauna, which includes a Jacuzzi tub for two, a dry cedar sauna and overhead double shower. Spa services include massages and customized body scrubs, relaxation massages, sugar butter body scrubs, Belavi Facelift Massages, hot stone massages, and reflexology.